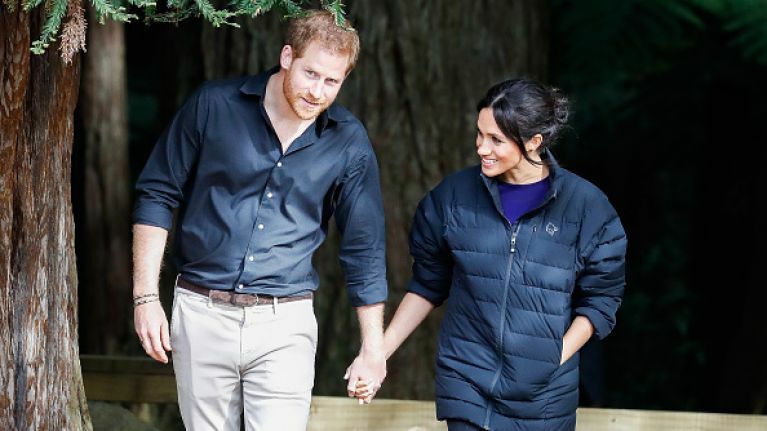 Prince Harry and Meghan Markle recently sent out their latest thank you card to fans of the royal family - and it may just be their most adorable one yet. The couple - as well as Kate Middleton and Prince William - sent out a special thank you to the well wishers who sent them Christmas cards over the holidays. Each of the royal couples sent out a separate card, with a heartwarming photo on the front of each. Royal fan Instagram account loopycrown3 shared a series of images of the cards she had received from the Duke and Duchess of Sussex and Duke and Duchess of Cambridge. Prince Harry and Meghan Markle's card showed a sweet moment from their tour to Australia, Fiji, Tonga, and New Zealand last year. The particular picture was taken as Prince Harry delivered a speech in Dubbo, Australia. As he stepped up to the podium, the skies opened up and it began to pour. Thankfully, Meghan was quick to come to the rescue with a brolly. "The Duke and Duchess of Sussex, thank you for the very kind message you sent for Christmas. "This was most thoughtful of you and greatly appreciated by Their Royal Highnesses who send their best wishes for Christmas, and for the New Year."